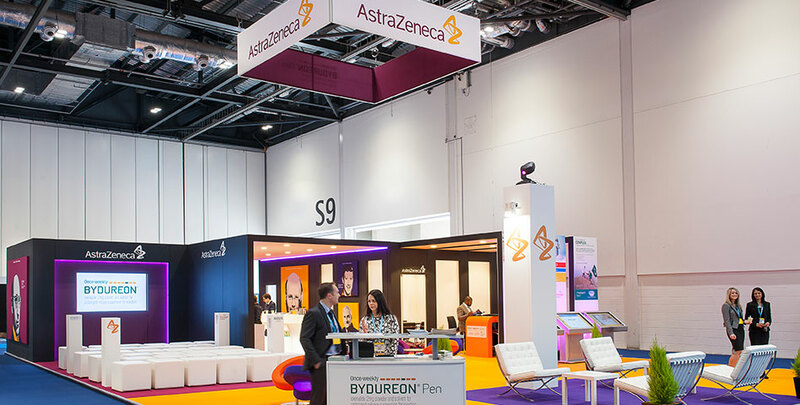 Our brief was to create an eye catching stand that improved AstraZeneca’s profile in the field of diabetes, highlighted their innovation and their 6 brands. We decided to create a design that was eye catching and demanded attention from the viewer. Through the use of secondary brand palette colours alongside a ‘pop art’ style we utilised images of innovators from all walks of life to add impact. We provided an ‘auditorium’ for about 15-20 people within the space on moveable cube seating which allowed flexibility of use outside the presentation times. Alongside the informal relaxed seating area which could be utilised for conversations we also included a completely private meeting space which could be used for more sensitive or serious conversations. We introduced the use of large interactive plasma screens and iPads to show content and patient videos. The Client felt that our solution completely answered their brief and created the attention and interest that they wanted it to. They received a return on their investment with this stand.